Lotte and I are finally back in Melbourne. In the end it felt as though a lifetime had passed since we first got the news that started off our 2 year adventure to England. And yet, inevitably, when we returned it felt a little like that was just a moment ago. It has predictably been a good time to reflect for both of us, and we’ve spent a lot of time just talking about what an amazing journey we’ve been on. We really have been so incredibly fortunate just to have the chance to do this. It’s difficult to describe how many ways we’ve been effected, but just by looking back over this blog it’s obvious that we’ve both been given all kinds of opportunities in terms of family, work, travel, dancing, teaching and (perhaps most significantly) life long friendships. The last couple of weeks in Cambridge were pretty frenetic, and they just reinforced this last point for us. First of all we performed in Perspectives with the troupe, who have all become really close friends to us. Doing a show for 6 nights in a row is such a great way to have fun, and Perspectives was the most rewarding performance experience of my life so far. The sense of inspiration it gave all of us was palpable and lasting, and every time we danced in the last couple of weeks it showed. And we did dance rather a lot. Somehow we ended up with a really intensive schedule, starting with our last night of teaching on Wednesday where again had something close to 60 students in the beginner class and 25 or so in intermediate. We held the AGM in between because there was no other time and we were really pleased when 6 new committee members put their nominations forward. Then on Friday night we taught a class at Wolfson, and partied until midnight and on Saturday it was the main event: the Lindyhopathon! Lotte did a wonderful job in her interview with ITV for the hopathon (above). Unfortunately Ros, the main organiser, was too sick on the day to be there for the interview. But the good news is that we raised over £5,700, including more than £450 for the taxi dances alone! Actually the media campaign for the event was very successful, because we had 2 radio interviews and a front page in the local weekly as well as this. At the very least there should be a few more people who are aware of it next time around. By Sunday night we had finished packing, and all that remained was to get rid of Lotte’s bike, and to party with everyone at The Snug in Lensfield Road. The send off turned out to be pretty emotional, particularly when Maria handed over a leather bound memory book with contributions from all of our friends. The book has all kinds of photos, stories, illustrations and in-jokes from the last two years. We’re going to add some of our own photos as well. At 7.15am on Monday morning we took the bus to Heathrow and promptly fell asleep, blissfully unaware that the bus would run into traffic on the way, delaying our arrival by about half an hour. We were also told by the driver that Terminal 4 was a mess because of roadworks, so we would be better off getting the train from the central bus terminal. We struggled down to the underground with all our stuff, and found that the next train was not for another 9 minutes. That was when we started to panic. We had to check in at least 90 minutes before departure, and with nearly an hour of delays we were now cutting it very fine. We formulated a plan that Lotte would run ahead to the Qantas check in desk while I struggled along behind with most of the luggage. For whatever reason, they don’t actually have a Qantas sign up anywhere at departures, and with about 2 minutes to spare Lotte was not strangely not all that amused when a she asked a BA employee where to go and he just scratched his head, pretending he’d never heard of Qantas! Eventually he directed her to the BA counter where I met her, just as she was told (to our great relief) that we had made it in time. There was just one problem. We had booked separately because I was claiming frequent flyer miles, and the plane was full, so there were no more seats together. We were still just thankful to be on the flight at all, but the lady at the desk started to see if she could work something out so we could sit together. It was at this point that Lotte let it slip that we were going home to get married. The lady was on the phone for about 5 minutes in total, and then just reached over with our boarding passes and said: “Sometimes it pays to be late. You’re going to be flying Business Class today”. Lotte literally jumped up and down on the spot and blew her kisses. I just stood in stunned silence, before giggling my head off. Needless to say the flight was absolutely amazing. The level of comfort is just unbelievable, and I remember thinking to myself “how could there be another class even higher than this?”. By chance we got seats right at the very front of the flight deck, directly behind the cockpit. It was like the flight was entirely for us, because we basically didn’t see anyone other than the pilots and the doting flight attendants. The seats recline to be as flat as beds, so we slept about 85% of the time, waking up only to eat the (really really good) meals. We figured out how much the bill for such extravagence would normally be: just under £9000: just under $A20,0000 AUD (you read that right). And yes, I got my flight on frequent flyer miles. Our saving? $A18,188.29. It’s 25 days, 20 hours and 39 minutes until we leave. It really feels like it too. That is, I have a strong sensation of time counting down in small increments, as though in the back of my mind a tiny hourglass is close to being empty. At our weekly “bun club” meeting this afternoon I actually had a strong sense of time-shift, as though I was observing everything from a distant future and looking back on my time here in Cambridge. All the forward-planning topics reminded me of a parallel universe in which I would not exist, and my thoughts drifted to Melbourne, where presumably some other meeting was taking place to determine my actual future. Well, we sold about 85% of the stuff in the Moving Sale almost immediately. 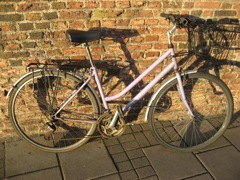 Today we got around to cleaning out more cupboards, and there are some more new items, including Lotte’s bike and my M.A. 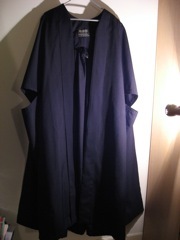 Gown. I’m really serious when I say — get in quick if you want any of this stuff!! Moving Sale. It’s time to start getting rid of our stuff because we just can’t take it all home to Melbourne. We decided to price everything so that it’d definitely go (many things are only 50p and some are actually free), so naturally this is first come, first served. A few items will be available in the week we move out (Jan 29) but most things are ready to go now. If you’re interested, here’s the page with photos and prices: Moving Sale. We’ve just returned from our trip to Holland for Christmas and Sweden for The Snowball. I think we saw almost everyone we could possibly have hoped to see on this trip, including both Ans and Ko’s families, lots of good friends from Holland, and lots of our European dancing friends. It was a jam packed trip, but we still felt like we had time to relax. Along the way had 3 days of Christmas celebrations, 5 dance parties, stacks of dinners out, and learnt how to play the Nintendo Wii (my shoulder still hurts, but not as much as Lotte’s).